I was honored to be 'webcam-interviewed' today by Tobias Ehnifrom the MMG ( MentalModels for GIMP ), a special development project from openusability , a non-profitorganisation who target a better usability for a lot of Free/Libreand Open Source Software (FLOSS). The target is of course GimpUi redesign for 2.8. I was really happy to can share with a professional of usabilitymy workflow, and also show my favorite feature and also painfullmoment while using the Gimp to do my digital painting job. Iended-up with pretty similar critic as the one I said during theKrita sprint in may2011 . Tobias took a long time to analysis my actions, andunderstand my workflow and daily task I do with Gimp. Many thanksto him for his patience and professionalism. This article is mainly a block of my various notes made beforeand after the interview. I hope they can be usefull for the MentalModels for GIMP project and also help the development of otherdigital painting software. 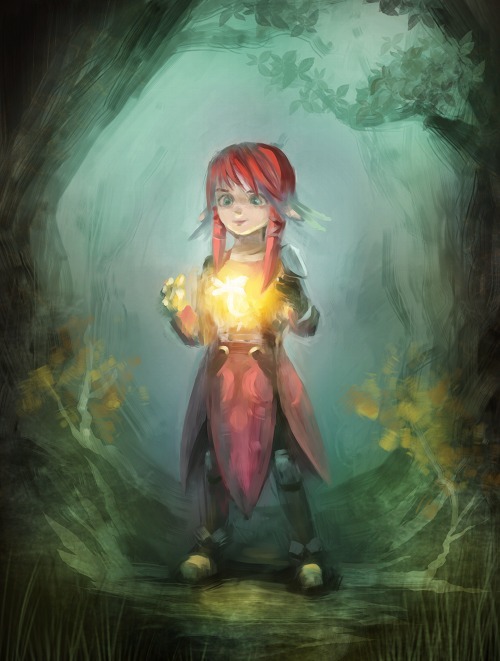 - downscale the document size, to paint thumbnails with good andfast painting performances. 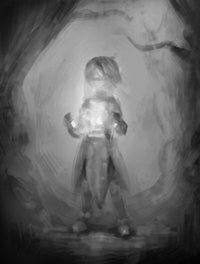 - when speedpainting got approved by client ( if not I continue totweak it ) , I start the detail process. - creation of a 'presentation' over my illustration : title design,logo ; interface ( Game Ui ) ( layer Fx are very productive for this, but no FLOSS softwares got it ) . - send file over FTP, server , dropbox-like service or more rarelyemails. - archive project when all over, clean on disk and create a backupfor later. Also during the whole process : export sometimes steps of my work ,as jpg preview for web , screen-sized for my client to check results. - I research hight efficiency and productivity. I use the mostkeyboard shortcut I can, work must be done fastly and effectively :time is money for my freelance micro-enterprise, and also for mycustommers. - I paint during long session from 3h to 7h continously with thesame apps open, stability is precious. If an app can do all , Iwill prefer. For the moment I jump between Mypaint and Gimp-painter the most , but if Gimp would have good performance/ergonomic I would probably stick to it for the whole process. - Have the control of the tool to can be "free" about it , andfocus on my artwork or feeling I want to share. - Don't make my art skill depend of commercials software company orservice ( Adobe / Autodesk / Corel / Microsoft ). That's all , feel free to comment, I also copied here under thedocument I created with all my feedback. In Gimp this 3 action are considered as 3 'tools', and also needsto be applied separately in a chain. Many tools use nowadaysmanipulators on the corners of a transformation whitch can performmoving/scaling/rotating within only one mode. They also display alow-resolution of the result real time, to get a more accuratefeedback of the future high res transformation. In Gimp, when performing a transform action , the source of thetransformation remains visible. And the 'Gizmo' ( the activelow-res real-time feedback of the transformation ) display on thetop of the layer stack , and without considering blendingmodes. In this condition applying a texture or a decals to a digitalpainting in 'overlay' blending mode become so painfull, that mostof my paintings became untextured when I switched to FLOSS. Workaround : Bind 3 shortcuts to Grab / Rotate / Scale ,try to anticipate them in a series of action , use tranform toolslayer option to display the active gizmo with a alpha transparencyto help positionning. Copy paste work for the moment works as default with a "floatinglayer" system , witch is confusing for me : I would expect theresult to be pasted in a layer above the copied content layer , andin the same place ( x,y position ). - "Paste as layer" paste the new content on a layer above asexpected , but with the position 0,0 on the top left corner. - Paste with floating, and press 'new layer' ( to transform thefloating selection into a new layer ) does the good things, but thelayer is always on the top of the stack ( witch is annoying on abig project with many layers ). Workaround : script ' paste-as-new-centered.scm ' from Rob Antonishen . Can't livewithout. If a layer have a 500x500px and is centered inside a 1000x1000pixel picture ( let says, it happen after a copy paste ) ; it'simpossible for the moment to paint outside the 500x500px area ofthis layer. Gimp should, imo , auto-expand the layer if a intention to paintoutside the area is detected. If user want to limit his painting action to an area, the selectiontool is fine for that. Note : here I don't use the layer limit display ( ugly yellow/blackdashed lines around layer limit, activated by default ) becauseit's hard to make eyecandy graphic with a constant display of this'helper' guide. Workaround : A script from Alexia Death ' maximize-and-defloat.scm ' binded to a key , to extend layersize to image. Discovered this a week ago , thanks Alexia. Before Idid Ctrl+A ( my shortcut for select all ) and a shortcut binded to'maximise layer to image size'. Here now I have all of this in onekey. A behavior for users to have in preference menu a checkbox toalways use Alpha layer by default. Many time it's annoying to opena picture, duplicate the base layer, and see the new layer createdinherit of the non-alpha feature of the base mono-layered picture. It's annoying to erase on a layer and have the 'background' colorwho appear instead of a hole in the layer because of this default behavior. Workaround : adding alpha channel each time manualy, rightclick on the layer , then 'add alpha channel'. Do this to many time a day. Having to go with hand on the opposite side of the keyboard topress on numkeypad '+' and '-' to have a kind of zoom shortcuts is counter-productive. ( hand position , need viewer attention toreposition hand ). Also , having the possiblity to set the mouse wheel to zoom in orzoom out is already possible, but painfull to do . It should be a default behavior, imo. 'Alt' . In Gimp it's became 'Ctrl' ; this different shortcut ishardcoded , can't be changed. the brush size can change exponentialy using shortcut ; nonlinear. Differents task sometimes needs different panel position ; evendifferent position on multi-screens. Saving configurations is already possible via copy/pastingpreference files , but a GUI would be more easy to switch workspace position. This thumbnails are displayed for the moment horyzontaly above theopened image. I prefer vertically , and also if I could reduce thesize of the thumbnails, vertical space is precious for my usage,and screen less hight and less hight. - Performances ( paint with big bitmap mask brush on big sizedpixel document faster and smoother ) - Presence of flow on thebrush system - Textured strokes ( having a pattern interacting withalpha of brush , scalable pattern ) Gimp-painter fork have. -Smudge and paint ( mixing / mixbrush / wet paint ) Gimp-painter fork have. Real layer fx are intense time saving, for creating 3D textures / for design / webdesign / digital painting (fake bumpmap ) and so on and so on. No other FLOSS raster tools have a similar features ( Inkscape start to get something similar, but for vectors ) , and I miss it a lot. License: CC-BY David Revoy, www.davidrevoy.com, 6 october 2011 . Great interview/feedback. I find myself agreeing with what you propose - I really need flow in my brushes (not even on gimp-git it is working). Encore une fois , c'est un superbe travail. Aurais-tu la video à vitesse réelle ? Car je pense que cela serait un bon "tutoriel" dans l'utilisation des outils et autres plumes. Il faudrait que je fasse un essai colo BD en partant sur le principe d'une illustration. Je pense que ca pourrait le faire. Merci encore pour ton partage de tes connaissances et des tes illustrations. Great review. You hit on a lot of topics and issues that I have run into over the last few months in attempts to replace Photoshop with GIMP primarily to move to Linux full time. 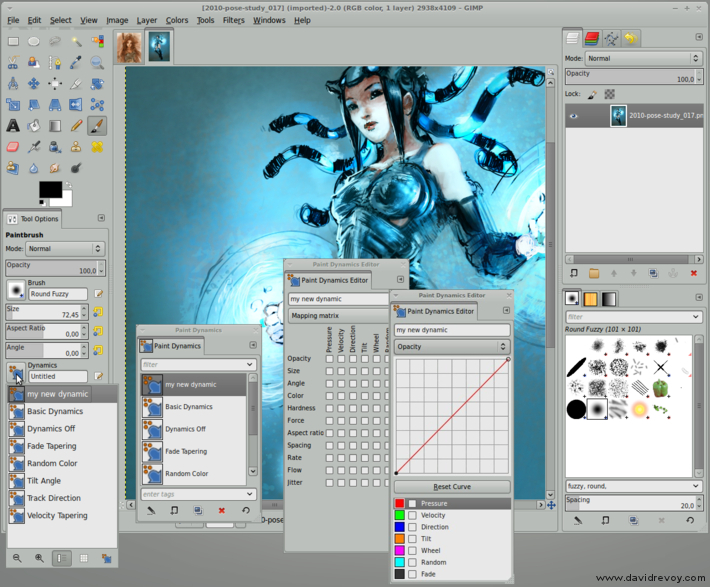 I have been able to modify some workflows but the the main issues that I have had with GIMP (with no insult to GIMP. It has come along way and I appreciate their efforts) are in regards to printed projects and large scale projects. CMYK support is a must; GIMP needs to utilize the resources of the system better and have increased responsiveness. When doing small projects at 300dpi, their is still lag in a lot of the tools. One other thing that I would love to see is the use of Adjustment Layers that allow for none destructive editing when applying color correction etc. @Blork (aka Blender_Player) : Pas de soucis et merci pour les mots sympa sur mon boulot et le timelapse. - Sinon quand a la tablette en elle même , à voir dans la doc d'ubuntu fr . Les spec du driver Linuxwacom ont changé tous les six mois depuis ces deux dernières années et ça a saccagé toutes les documentations sur le sujet ou presque. Faire confiance donc au doc qui traite de votre tablette pour votre systême. Et aussi, pour la doc technique sur http://sourceforge.net/apps/mediawiki/linuxwacom/index.php?title=Main_Page , c'est là ou j'apprends. J'ai installé GPS et j'ai modifié le fichier xorg.conf comme indiqué. Je n'ai pas encore eu le temps d'expérimenter ma Wacom depuis ces changements mais je suis ur que tout va bien marcher. Hello David, haven't commented for a while on your stuff even though I watch all posts since I subscribe to your feed. Your skill is continuously improving. I really appreciate the video, these things are always educational for me as it seems almost every artist has a unique workflow and I tend to pick up different things when I see these and try to emulate. What I found most interesting in this vid was towards the final stage when you were painting the environment how quickly you moved along. These were obviously finishing touches like the tree leaves in the upper corner and the foliage in the lower middle ground. Also I found your comments about texture overlays interesting. In my workflow I use them a lot lately, for quite a few things, but I've seen their limitations too. Really appreaciate it, keep up the great work and showing people how good GIMP can be.